Dr. Geophysics' Weblog | A cool weblog, thanks for visiting! Some fun resources related to Radar based technologies. Are you interested in building and testing your own imaging radar system? MIT Lincoln Laboratory offers this 3-week course in the design, fabrication, and test of a laptop-based radar sensor capable of measuring Doppler, range, and forming synthetic aperture radar (SAR) images. How small can these get? Really small. This small, cheap, fast, and powerful LiDAR promises to open up new applications we haven’t even imagined yet. And it’s due in a few years. Need more background regarding radar systems–MIT has you covered. This set of 10 lectures (about 11+ hours in duration) was excerpted from a three-day course developed at MIT Lincoln Laboratory to provide an understanding of radar systems concepts and technologies to military officers and DoD civilians involved in radar systems development, acquisition, and related fields. I am not supporting this, but found a corporate training opportunity. There are YouTube videos showing the final system the cost seems high, but I had fun looking over the web site and associated YouTube videos. Some software details can be found at this site. Learn how radar systems work by reviewing applied electromagnetics, circuit design, and antennas. Then build your own and perform field experiments including ranging, Doppler, and SAR imaging. Real time earthquake monitoring sites–an incomplete resource. As everyone else in geophysics I’ve become involved in seismic monitoring. Some URLs related to real-time or near real-time monitoring sites are listed below. I’ll continue to add to this as needed and hope you might find these helpful. The olds well remember how close the US and USSR came by nuclear war in the 1980’s. Many people of this generation still have nightmares recalling preparing for the aftermath of such as almost unimaginable nightmare. For younger people who didn’t live it, this dangerous global situation is simply unimaginable imo. Lt. Col. Stanislav Petrov was a 44 year old Soviet military officer on the front lines of this world and received a message on September 26, 1983 that the United States had launched five nuclear missiles towards Moscow. For those of this age, nightmares about the results of such a strike are still common, this was an unimaginable scenario, now fully verified, checked and rechecked, or at least it seemed. He had 20 minutes to determine what to do. The bright red “Launch” button in front of him was activated and alarm sirens sounded throughout his command. So would end the world. Petrov was unusual for the commanders in this branch of the military, he was one of the few officers who had received a civilian education, and reasoned that this was most likely a false alarm despite the high quality of the alarm and the multiple checks already applied. Other false alarms include this 1979 event, and this 1983 NATO activity. The world is very, very, very lucky that Lt. Col Petrov was on duty that evening. His decision and action, not to launch, took true courage, which he displayed. Details from him, including an interview can be found here. When you enjoy September 26, 2017, be sure to think of the late Stanislov Petrov (Sept 9, 1939-May 19, 2017). We enjoy this world and day because of his actions: A single person saving the world late in the evening, using his education and best thinking. Want more? Oh yeah, there’s a movie too. July 28th, 2017 marks the 100 year anniversary of the Silent Parade. This was the first such protest in New York history and an incredibly important event in the history of the Civil Rights movement. In New York City, perhaps as many as 10,000 people marched down Fifth Avenue in silent, strong and unambiguous response to the bloody East Saint Louis riots that occurred during May and July of 1917. For me, the courage of these individuals inspires us to always look towards a more just and better future, regardless of the obstacles or challenges of the moment. I hope you enjoy the day and take time to honor these Americans. A Google Doodle recording this event can be viewed here. I hope you enjoy the day–Spring has arrived and the International Day of Astronauts along with it. Temblor, like it or not, it is a thing. The word temblor associated with reporting of earthquakes seems to be a thing, have you encountered it? Temblor was also a Batgirl villain (in the Kid’s WB animated TV series), but that’s not what we’re talking about. Need more details about the English language word “temblor” usage associated with earthquakes; please check this fascinating Word Routes contribution. Don’t like the use of this word -> temblor? Here is something you might enjoy reading. Looking for a single-word definition of temblor? This link has you covered. Word detective jumps into temblor waters (be sure to read the comments), with an enjoyable read with this link. When all else fails–check the Wiki page. Even Sonicfrog got into this. Sorry for the gap in posts! Geophysics continues to be central to everything. Lately I’ve spent some time living in Berlin and continue working in the areas of induced seismicity and seismic monitoring. I enjoyed Berlin, it is one of the world’s great cities, and Berlin reminded me somewhat of New York City in the 1980s. What a place. The downturn in the energy industry has also focused my attention on longer term guesses at the energy framework globally over the next couple of decades. I hope you are enjoying the summer. Things are especially busy this summer for reasons unknown. For those who might be living in a cave somewhere, the investigation of background variation in earthquake frequency related to produced water injection has become a very hot topic. Some earlier posts covered this, but here is another one. An excellent USGS reports about the subject, focused on Oklahoma, can be found here. An easily understood overview regarding these events can be found here. A USGS OpenFile report: Incorporating induced seismicity in the 2014 US National Seismic Hazard Model–Results of the 2014 workshop and sensitivity studies. Can be found here. A series of presentations and other documents from an excellent induced seismicity workshop, coincident with a major winter weather event in Oklahoma (! ), can be found here. An important Science article, by William Ellsworth, can be found here. Be sure to carefully review this and his excellent and accessible presentations that can easily be found on the web. A Virginia Tech resource related to induced earthquakes can be found here. The Kansas Geological Survey (an excellent organization), has induced seismicity related information that can be found here. As earlier posted, but very useful and helpful, the Lawrence Berkeley National Laboratory site discussing induced seismicity can be found here. The induced seismicity wiki can be found here. To prove that people are following this activity, take some time and read this popular press article about “Underground Weather”. Predicting earthquakes–that should be easy eh? IMO, if the appropriate tensor nature of the earth system, multi-scale physics, heterogeneity, and anisotropy are properly incorporated it should be a piece of cake. Earthquake information on the web. To help you find immediate information about earthquakes please find some sites I check routinely. Map of seismographs in the US. Earthquakes observed in the last two weeks (IRIS site). Select a seismic station and view seismograph data for last 48 hours. Determine the seismographs closest to your site using this handy table. They using the Station name examine the earthquake records directly using their station name. This is the tables of all sites, including the states located within. Examine latest 24 hour vertical seismograph data (the up and down earth motion of the seismograph) for every Transportable array seismograph. USGS 1 Day, Magnitude 2.5+ Worldwide earthquake list and data. Earthquake instant notification service (computer and text messages from USGS). USGS Earthquake related products and services. GFZ (German) map of global seismicity. Does not include smaller events in North America that are seen in the USGS and IRIS sites. List of recent earthquakes from GFZ (German). Does not include smaller events in North America that are seen in the USGS and IRIS sites. Seismograph not close enough? Need one closer? How about working with IRIS and a local school to install one! That would give you a local seismograph right in your neighborhood and inspire kids to look at tiny wiggles; like true geophysicists! What could possibly be more inspiring? This link describes the atmospheric sensors useful in detecting air shocks. Please note that there is another post on this site just looking at nuclear monitoring using atmospheric data. The link below describes the hardware added to some seismographs to detect airshocks. There is a lot of information out there a function of the faster than exponential technological change we live within. Good luck! Enjoy the spring. I hope you have a pleasant International Geologists Day 2015. This is celebrated on the first Sunday of April, or April 5th, 2015 this year. 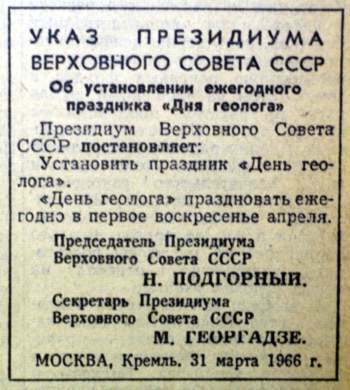 You can also celebrate the date that this wonderful holiday was proclaimed in the USSR, March 31st, 1966. Happy Geologists Day!